Separately, we speak many different languages. But today, we all speak one language. That language is soccer. Those remarks (more or less accurate) were part of the welcome to the Opening Ceremony of the 2012 Redeemer Cup by main sponsor Chobani‘s CEO Hamdi Ulukaya. Ulukaya was one of the speakers getting the waiting teams and crowd pumped up and ready for the 3rd annual Redeemer Cup Soccer Tournament. The Butanese Nepali Team getting pumped up! 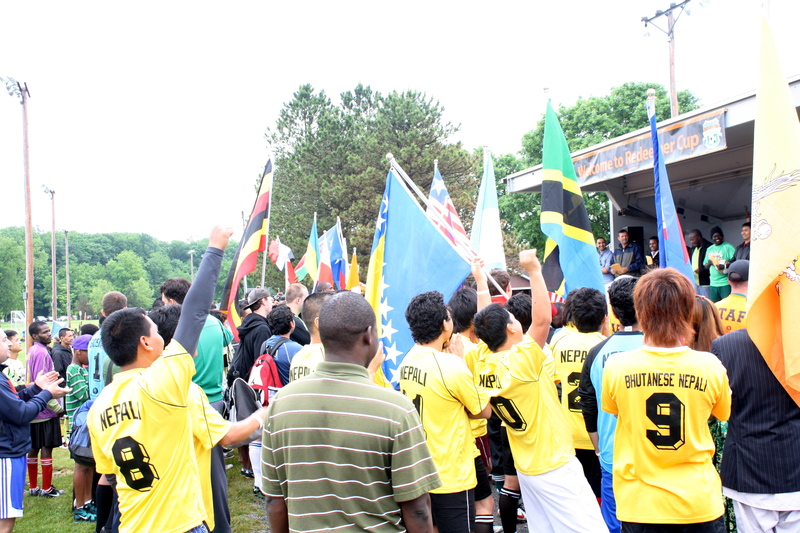 Saturday June 2nd at Proctor Park in Utica began rainy and cold, but it seems as though the excitement for the Redeemer Cup burned it away. Upon arriving to the festivities I found over a dozen different brightly colored shirts milling around and getting organized, with team names on the back representing ethnic refugee groups and refugee community organizations such as the Mohawk Valley Resource Center for Refugees and Redeemer Church. At about 10:30 the procession of teams began – truly a sight to see. Each group marched through the crowd lead by a flag and sign holder. The signs signified the ethnic group, followed by the world American – i.e. “Polish American” or “Iraqi American” – as Redeemer Church’s Pastor Rick Andrews said, no matter where we come from, we are all Americans now. Each team that processed by was bursting with pride, but as the groups assembled there was a lot of interaction with the other groups. Finally, the whistle blew and soccer began. Games continued on four fields throughout Saturday and into Sunday, with lots of friendly competition. Many members of both the refugee and local community came to support their friends and neighbors. Sunday’s final game came down to the Bosnian American team vs Liberian American, with Bosnian ultimately coming out on top!